Sometimes when buying a new notebook, we are too eager to stuff the notebook with various applications that we need both to work and enjoy entertainment in the notebook. Often we do not care about the possibility of software that we install is threatening the health of the Operating System that we use. When we find the Operating System "Crash", we just panicked and not a few who meet a dead end and then choose to re-install the Operating System from scratch. Must be really annoying, is not it ?. Actually, it can we maybe by preparing an "Image" that the contents of the Operating System while still in good health. And this time we will give tips Make Your Own Recovery Partition. But keep in mind, preferably when making backups, make the installed app the least possible. For example, Operating System plus driver only. That way, no need to create a large partition to accommodate a large image as well. Because more and more software is installed before recovery, will make the image size increasingly bloated. After understanding all the above information, please go to step by step below. We select windows 7 because, at this time, notebooks and netbooks are sold based on this operating system. For those of you who have one partition in your windows operating system, inevitably you have to do shrink drive C you first to be available empty space for the partition that will be made as a place to store image recovery. 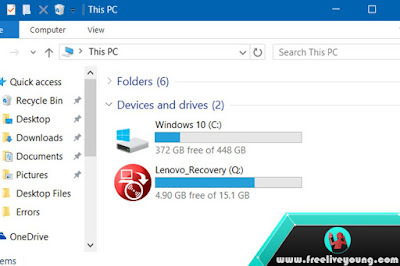 For Windows 32-Bit, you can simply set aside 15GB of free space to be partitioned recovery. Unlike the 64-Bit Windows that requires at least 25GB of free hard disk space. After Shrink C partition is complete, there will be unallocated space according to what you specified at the beginning of Shrink drive. Next, live you right-click Unallocated free space and select Create New Partition. Make the new partition "Z", then choose the format. For those of you who previously partitioned your HDD more than one partition. You can do partition recovery by shrinking the Data partition. With note, the data partition that will be in-Shrink still has enough space to be taken. The trick is similar to the above step, the difference is the only partition in the Shrink is not anymore C.
Then continue by opening the "Backup & Restore" menu from the control panel. In this window, select Create System Image. Automatically, the system will detect the partition you created but with warning so you should choose another drive as partition recovery to avoid loss of recovery partition when HDD is damaged. Just ignore it. And select Next to continue the process of making an image backup. This process takes 20 to 30 minutes. After the image backup process is complete, you will be offered to create a recovery disc that will serve as a medium of introduction to start the recovery process. Now you already have System repair disk that is needed when your Windows problem in the future. To use it, you simply turn on your computer as usual by changing the boot option to DVD Drive and the system will automatically detect the recovery partition you created earlier. Leave confirmation by pressing next, the recording process will start running for about 15 to 20 minutes. If nothing is wrong, after the process is complete, you can get your windows back in the exact condition when you created the previous partition recovery. That's Recovery steps. Well, so tips on Creating Your Own Recovery Partition. Good luck.